Following the success of its limited-run U.S. theatrical premiere in November, its stunning first-place finish on television in December, and its triumphant Superbowl lead-in this past January, the film “Car Men” is set to make its online debut. 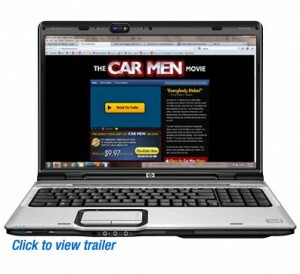 Celebrity Films is excited to announce the online world premiere of the film “Car Men”. The documentary, which features two Winston-Salem business owners, details the touching and occasionally hilarious story of how the Myers men created a car business that’s known all across America for its successful out-of-the-box thinking – not to mention its off-kilter TV commercials, featuring such quirky characters as Uncle Frank and Chainsaw Charlie. “Car Men” reveals an in-depth look at the Myers men, Frank and Tracy. While Tracy Myers may play outrageous on television to sell cars – this best-selling author, nationally-recognized entrepreneur, and devoted family man is dead serious when it comes to building a business he, his family and his city can be proud of. “The feedback we’ve received for this film has been overwhelmingly positive and I’m honored that Celebrity Films has decided to share it with everyone online,” said Tracy Myers, one of the stars of the film. The original Frank Myers Store was started more than 83 years ago by Frank Myers, the Great-Grandfather of the current owner Tracy Myers and the Grandfather of the previous owner, Franklin Myers. Tracy has spent the past 15+ years trying to change the landscape of the car business and the bruised reputation of car salespeople all over the country. Tracy was one of the first 100 Certified Master Dealers in the Nation, a NIADA Eagle Award Winner and was the youngest recipient ever to be honored with the highest available distinction in the used car industry…the National Quality Dealer award. Frank Myers Auto Maxx was recently recognized as one of the Top 22 Independent Automotive Retailers in the United States by Auto Dealer Monthly Magazine, one of the Top 10 Internet Auto Retailers in the Nation and one of the Top 3 dealerships to work for in the country by The Dealer Business Journal. Tracy is also the Co-Creator of the world famous “Everybody Rides” program and author of the best selling book “Uncle Frank Sez” available at Amazon.com and better bookstores. He is a Christian Business Owner whose goal is to run his business “By the Book”. The dealership specializes in helping people find, qualify for and own the vehicle of their dreams with little or no money down…even with less than perfect credit. As one auto pro says, “In the car business, Tracy Myers is who everybody wants to be.” Watch “Car Men” and you’ll find out why.